... that if a vaidya (Ayurvedic expert) fully knows how to use Triphala he can rectify any imbalance. Triphala is highly revered in Ayurveda and is available from Maharishi Ayurveda as Triphala with Rose. It is also used as an ingredient in several of our other preparations. Triphala means "three fruits" - the three fruits being Haritaki, Amalaki and Bibhitaki. When combined as Triphala, they form a very powerful rasayana. A rasayana is a highly intelligent herbal combination that enlivens the inner intelligence of mind and body from a fundamental level and thereby promotes rejuvenation and long life. Besides nourishing the mind and body and promoting longevity, Triphala has many specific effects. It is particularly rejuvenating for the digestive tract, and is a rasayana for the eyes and the skin. When combined with Rose petals (Rosa centifolia) many of these benefits are enhanced. One of the principle actions of Triphala is that it balances Apana Vata, the subdosha of Vata that governs the colon, lower abdomen, menstrual flow and elimination . It is a mild laxative, and for that reason it is excellent for clearing toxins from the digestive system. Because it is mild in its action, you can take Triphala safely for long periods of time, and then it has a deeply purifying effect. It goes ‘deeper’ into the physiology and releases the toxins at a more fundamental level. This can be understood in terms of the seven main tissues (dhatus) recognised by Ayurveda.Ayurveda says that these tissues are formed in the following sequence - Rasa (the nutrient fluid derived from food), Rakta (blood), Mamsa (muscle), Meda (fat), Asthi (bone), Majja (bone marrow) and lastly Shukra (reproductive fluid). When taken regularly Triphala cleanses toxins in the first four tissues, up to and including Meda, the fat tissue. You can see that this is a much deeper effect than just cleansing the bowel. Because it detoxifies the blood, muscle and fat tissues, Triphala is excellent for maintaining the health of the skin. And because it removes ama from the fat tissue, Triphala also helps to keep cholesterol in balance. Triphala enhances all thirteen agnis, the digestive fires or transformational processes, especially the panchagni, the main digestive fire in the stomach. The 13 agnis include the seven dhatuagnis that each transform one tissue into the next one in the sequence mentioned above. It is in the gaps between the tissues that the intelligence of nature particularly operates, and if there is any dullness in these gaps Triphala helps to enliven it. That is what makes it a great rasayana. Triphala has two of the three major herbs contained in Maharishi Amrit Kalash, which is the most highly refined and rejuvenating rasayana of all. If taken regularly Triphala is also a powerful anti-aging rasayana. In addition it pacifies both Kapha and Pitta as well as purifying the urinary system. Modern research confirms the traditional knowledge about Triphala in that studies have shown that it does help maintain the integrity of DNA, a basic expression of the body’s intelligence, when DNA is exposed to mutagens and radiation. Haritaki is a much prized fruit. The sage Charaka goes so far as to say that it is as nourishing and useful for everyone as mother's milk. He mentions that it is a rasayana for the eyes (netra ruja apaharini). Haritaki is also a rasayana for the skin. It is known as a twagamayagni, which means that it maintains balance in all aspects of the skin. Sushruta Samhita, a classical ayurvedic text on surgery, says that Haritaki and Triphala are useful in cleansing wounds and supporting healing and regeneration from the inside. Charaka also says that Haritaki is good for the digestive system. It helps enhance the absorption of nutrients in food. It also supports the health of the heart. Another excellent quality of this fruit is that it cleanses the macro and micro circulatory channels, known as shrotas in Ayurveda. In one verse of Charaka Samhita, it says Haritaki is shrotovishodhini, which means that it can clear the body’s channels, big and small. The Bhavprakash Nigantu, an ayurvedic text on herbal science, mentions that Haritaki is a yogavahini, which means that it cleanses the channels and is absorbed quickly by the body. Amalaki fruit or Amla, is another of the most prized herbs in India. Even by itself it is considered to be a powerful rasayana, so much so that it is said to be divine. The Charaka Samhita says, "Amalaki is the best among rejuvenative herbs”. Amalaki fruit contains the sweet, sour, bitter, astringent and pungent tastes. The only taste missing is salty. Because it contains five out of the six tastes, it is balancing to all three doshas. The initial taste of Amalaki is primarily sour, but when it mixes with the saliva, its aftertaste (vipaka) is sweet. Both sweet and sour tastes pacify Vata dosha. Amalaki's virya or potency is cool, so along with the sweet aftertaste, this coolness pacifies the hot Pitta. The bitter, astringent and pungent tastes of Amalaki balance Kapha. So that is how this one fruit pacifies all three doshas. Amalaki has so many excellent qualities that it is hard to know where to begin. Purification is a theme common to many of these qualities. Amalaki helps cleanse the body in various ways. One way is by enhancing digestion and food absorption. When your digestion becomes stronger, the food you eat is converted into useful substances rather than staying undigested and becoming toxic. A rare quality of Amalaki is that it heightens digestion without being heating. That is why it is traditionally considered one of the best herbs for balancing stomach acidity. Another way that Amalaki helps purify toxins is by supporting the all-important liver function. The liver is the main detoxifying organ and we rely on its efficient functioning to deal with the side-effects of our dietary and lifestyle errors and exposure to pollutants etc. Amalaki also helps elimination. It supports Apana Vata so that evacuation of the bowel, urine, and menstrual flow is effective. It is particularly supportive for the urinary system and it acts as a mild diuretic, helping the body eliminate excess water in a natural way that is not disruptive or harmful to the body. In addition Amalaki is said to have a cleansing effect on all the tissues (dhatus) throughout the body, and to support specific organs. Lungs: By balancing Shleshaka kapha, the regulator of moisture balance in the lungs, it helps maintain resistance to infections. Reproduction: By balancing Apana Vata the health of the menstrual cycle, sperm, ovaries, uterus and conception are maintained. Nervous system: It’s ‘medhya’ properties support and co-ordinate the acquisition, retention, and recall of knowledge and development of intellect, mind and sensory awareness. Cardiovascular system: Through its high vitamin C content it improves assimilation of iron and thereby contributes to the health of the blood. Muscles: Because it enhances protein synthesis, promotes a positive nitrogen balance and strengthens the muscles, it contributes to lean muscle mass. Eyes: It is a rasayana for strengthening the eyes. It enhances both Ranjaka Pitta (that governs liver function and the blood plasma) and Alochaka Pitta (that governs the eyes and vision). Hair, nails and teeth: By helping to improve absorption of calcium and other nutrients nails and teeth are maintained and greying and thinning of the hair reduced. Immunity. It is one of the most concentrated and absorbable sources of vitamin C in the plant kingdom. The vitamin C is in a very stable form due to the presence of tannins. Antioxidant. Partly because of the presence of vitamin C and quercetin it is a powerful antioxidant and immunity-enhancer. Bibhitaki is yet another fruit famous in the classical Ayurvedic texts for its many good qualities, though there is not yet so much modern research on it. Sushruta Samhita says that Bibhitaki helps to purify the blood, maintain normal blood clotting ability and purify and keep the channels (shrotas) in the body clear. Charaka also reports that Bibhitaki is ideal for pacifying both Pitta and Kapha - it is cool to the touch, pacifying Pitta, but is hot when you eat it and thus pacifies Kapha; that it cleanses the Rasa, Rakta, Mamsa and Meda dhatus; that it is excellent for balancing and nurturing the vocal chords; is antibacterial and is chakshusya (a rasayana for the eyes). Sushruta Samhita states that Bibhitaki has a bhedana effect, which means that it helps to keep the channels (shrotas) open through its heating effect. The Bhavprakash Nigantu also mentions that Bibhitaki is nourishing for the eyes. Bibhitaki also nourishes the hair, and helps maintain the hair roots, colour, and thickness. The petals of the Cabbage or Provence Rose – Rosa Centifolia (both shatapatri and centifolia mean ‘having one hundred petals’) are yet another plant material renowned for their many health giving properties. They are used in several Maharishi Ayurveda preparations. Rose petals have their main effect in balancing Sadhaka Pitta, the subdosha that governs the heart and emotions. So the long tradition associating roses with the heart is valid even at a fundamental level. What is less obvious is that rose petals also balance the mind by enhancing the coordination between Sadhaka Pitta and Prana Vata (the subdosha of Vata that governs the brain, head, chest, respiration, sensory perception, and the mind). Like Amalaki, rose petals are cooling, yet they enhance agni, the digestive fire. This is a rare quality that gives balance to all three doshas. Specifically rose petals help maintain the health of the skin, eyes and menstrual flow. All these properties are not lost on modern researchers, who are investigating the effect of the rose in balancing hormones and creating overall well-being. The essential oil of rose is of course renowned in aromatherapy and is being investigated for its antibacterial, anti-inflammatory, and anti-hemorrhagic properties. The subcontinent of India is blessed with a wealth of valuable herbs but its greatest resource is Samyoga, the knowledge of how to best combine and use them. Even though single whole herbs are much safer than single active ingredients they can cause imbalances if used unwisely or for long periods. Samyoga teaches how to combine herbal ingredients so that they produce the most balancing influence and greatest safety. 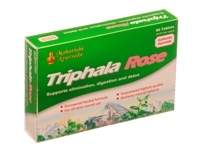 Triphala and Maharishi Ayurveda’s Triphala with Rose are sophisticated formulas that employ the synergy of the various ingredients for greatest efficacy and safety. The benefits of Triphala and its ingredients that the classical texts record will only be experienced in practice if the selection and preparation of the ingredients carefully follows the instructions of the Ayurvedic sages. Maharishi Ayurveda is committed to using only the highest quality ingredients and upholding the authenticity of the Ayurvedic tradition whatever the cost. For example there are seven varieties of Haritaki , each having one or more of the benefits mentioned above. However there is one variety, called Vijaya that has all the benefits and is recommended by all the Ayurvedic seers as the best to use. Maharishi Ayurveda only uses the Vijaya Haritaki in its Triphala with Rose. However the Vijaya variety is the most rare and costly, being ten times the price of the other varieties. Careful selection of the best geographical and climatic source for the material and ensuring that the growing area is free from air, soil and water pollution and artificial fertilizers. Ensure that there are adequate and sustainable supplies of the plant material. Training collectors to harvest the materials at their peak vitality, neither too soon not too late. Sometimes this is determined by the phase of the moon and presents some logistical challenges. Careful sorting and testing of the plants under the supervision of experts in herbal identification. Tests include for those for microbiological and heavy element contamination. Processing the herbs in appropriate and very sanitary conditions. For example special grinders that do not heat the material unduly have to be used. Testing the finished product for various parameters including chromatographic fingerprinting. Maintaining a robust system to ensure that all elements of quality control are consistently applied through inspection and certification by independent bodies (e.g. GMP, WHO-GMP, HACCP and ISO9001:2000). Eat fresh, organic, well-cooked foods whenever possible and sweet, juicy fruits. Drink plenty of warm water throughout the day to help flush out toxins. Go to bed by 10 p.m. so your body can rest during its natural purification period from 10 p.m. to 2 a.m. That will go a long way in purifying your body of toxins. Eat your main meal at midday, when your digestive fire is high. Eat lighter at breakfast and supper, when your digestion is not as strong. Save the harder-to-digest foods such as yogurt, meats (if you're not vegetarian), and potatoes for the noon meal. Eat in a settled atmosphere and only when you're hungry, and wait a full 3 hours after a main meal before snacking. This will allow the food to digest properly. Eat only until you are 3/4 full. Usually it takes a few minutes for the brain to register that you're full, so if you eat until you're full, you're probably going to feel uncomfortable a while later. Also, the digestive system needs some space to operate in, so eating until your stomach is full will inhibit digestion. Sit quietly for five minutes after the meal to allow your digestion to get off to a good start. When taken regularly, Triphala and Triphala with Rose are inexpensive and yet very valuable rasayanas, with great cleansing value and broad health benefits. The degree of benefit will depend on the extent to which the products have been carefully manufactured using the best ingredients, and are supported by a good diet and lifestyle. Ayurveda has been practised in India for thousands of years. In the mid-1980’s the knowledge of Ayurveda, parts of which had become lost, was re-enlivened in terms of its fundamental principles by Maharishi Mahesh Yogi in collaboration with leading Ayurvedic physicians and restored to its completeness. This complete Ayurveda, called ‘Maharishi Ayurveda’, stands for the highest quality and is enjoying increasing recognition world wide.